A lot of bloggers use yoast as their primary wordpress seo weapon, because its really efficient in managing and manipulating your wordpress seo to the next level. Doing SEO of your blog was never so much easy before but now due to a lot of best seo tools present in the market, doing SEO is no more a problem. I already have written very beginners guides about wordpress seo like what you should do after setting up your blog. And how to submit your sitemaps, after starting your first wordpress blog. However, this article is going to take everything inside itself, you don’t need to worry for sitemaps, on page seo and social media open graph tags after setting up the ultimate wordpress seo tool Yoast for your blog. WordPress SEO By Yoast adds fields like meta description, seo title and focus keyword for your every post being compiled in wordpress. WordPress SEO By Yoast lets your decide the meta description of categories and other archive pages. WordPress SEO By Yoast helps you to link up author profile of google, Google Plus official page, Twitter Cards, Facebook open graph tags. Yoast helps you modify the title format for any page of your WordPress blog, like whether you want the name of the blog to appear first or in the last. It updates as soon as a new change is done to the Google algorithm, like now in these days tags are not given much importance in SEO, that’s why yoast doesn’t adds tags but it has an option for meta tags to be turned on for those people who really think that tags are better for wordpress seo. Login to your wordpress self hosted blog dashboard, and go to : Plugins > Add New. There you need to search for “WordPress SEO by yoast“, after you find this plugin just click on install now and then activate it. After having wordpress seo by yoast installed in your wordpress blog, now you just need to configure it correctly for the best seo results. After you have installed, wordpress seo by yoast plugin to your blog. You will notice a separate menu has been created in your admin panel with title “SEO”, all your configuration of the wordpress seo by yoast lies inside this menu. 1- There is one more good thing about the yoast wordpress seo plugin, that you can also verify and add your site to the Alexa, Google and Bing webmaster tools. 1- In the title template you can easily change the title of your homepage, the way it appears to the people and the search engine. I have kept it as “Sitename, Page | Site Description text of WordPress“, this is how it is going to appear at the homepage, in the same order. 2- In the next tab you will be able to adjust how title appears for every single post to the users and as well as search engines. 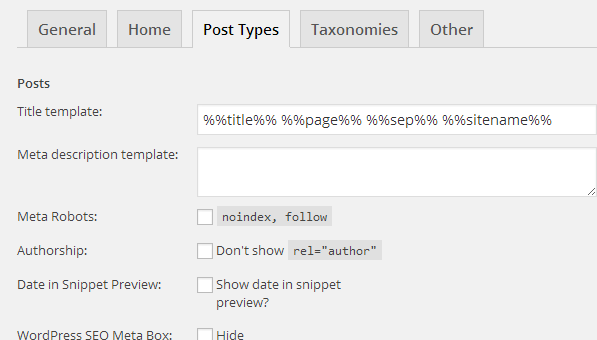 You can change the format easily by moving those percentage elements at your desired position for a best wordpress seo title. You must fill out very field of the social menu under the yoast plugin main menu, specially the Google plus profile settings must be done in your wordpress profile. Like, your Google’s profile link must be added to your wordpress self hosted blog profile under the users section so that you may be able to use the dropdown shown in the Google plus section of WordPress SEO by yoast under social settings. Have a look at the above screenshot, that how have I linked up the social media pages of talkofweb plus my Google plus profile to the wordpress seo yoast plugin. WordPress seo by yoast gives you the sitemap url of your site also, and the sitemaps have the different kinds, like sitemap of posts, categories of the tags, pages etc. You can get the link of all the sitemaps at : www.yoursite.com/sitemap.xml, plus after taking the links you must submit it to the google one by one. There is nothing much to do settings for the sitemaps section of yoast wordpress seo plugin. All you have to take care is not to deindex your blog posts from the sitemap section by clicking on not to index type of check boxes. However, if you don’t have quality pages for example then you can take such steps, but keep in mind that de-indexed webpages are not listed in google search results. There is nothing much to do in the wordpress seo by yoast’s permalinks settings page. If you want to experiment with this section then you can as there are 99% chances that such settings don’t have the negative effect on your blog. But keep in mind that your blog url must be the seo friendly and you can make your permalinks to consist of post title by going to Settings > Permalinks. This is the important step as it contains the breadcrumbs area which helps google to get your structured navigate able content. If you don’t know about the breadcrumbs then you can google about it, it really helps a lot to make your website appear in structural way like in categorized way in the search results. All you need to do is to enable the wordpress seo by yoast breadcrumbs, tick that option and press save, rest do any type of settings here for what so ever your like. But now you need to add the breadcrumbs output code to the header.php end , in your current wordpress activated theme! This code just outputs the breadcrumbs with the right structural data to help search engines get the categories of your blog and show these categories as the structured data for the posts. Now, you have done setting up plugin as per your needs. What you should do now is to add a new post, and just after the wordpress post editor you will notice new seo fields are added where you can write SEO Title, meta description and much more. Keep in mind not to go for words beyond the limits mentioned and also try to make that “Circle” green which is being shown in the top right block of the post c0mpilation screen of the wordpress where you add new posts. A green color shows that the post has been optimized for the best seo. That’s it, just fill these fields for every new post you add. Great goods from you, man. I’ve remember your stuff prior to and you’re just extremely wonderful. I actually like what you have received here, really like what you are saying and the way in which wherein you are saying it. You’re making it entertaining and you still take care of to keep it wise. I can’t wait to learn much more from you. This is really a great web site. this is the great post which about seo tools it very informative I read this topic and get knowledge form this post thanks for info.